In the wired world of phishing scams, trojan horses, and data hacking, identity theft can happen to almost anyone, at any time. So it's extremely important to protect your personal information and to take certain steps quickly to minimize the potential damage from identity theft if your information is accidentally disclosed or deliberately stolen. Close any accounts that have been tampered with or established fraudulently. Call the security or fraud departments of each company where an account was opened or changed without your okay. Follow up in writing, with copies of supporting documents. Use the ID Theft Affidavit to support your written statement. Then ask for verification that the disputed account has been closed and the fraudulent debts discharged. Keep copies of documents and records of your conversations. File a police report with local law enforcement officials. 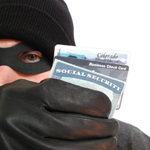 This is an essential step in claiming your rights as a victim of identity theft. For a detailed guide on steps to take when your identity has been stolen, read Take Charge: Fighting Back Against Identity Theft.